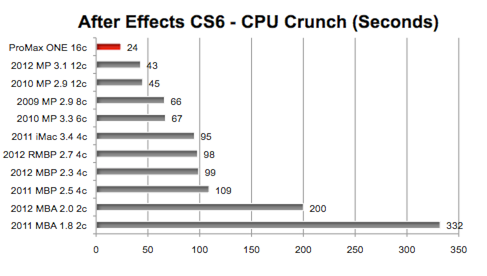 GPU acceleration in After Effects CS6: Which Mac does it better? Let's cut to the chase. The most exciting new feature in Adobe After Effects CS6 is the ability to render certain projects using the graphics processor. To dramatize this, we used the ray-traced 3D render option in After Effects CS6 to render a sample AE project with a 3D animation of a robot**. LOWEST number equals fastest. ** The ray-traced 3D animation was provided courtesy of Juan Salvo and Danny Princz. GeForce GTX 580 and 570 provided courtesy of MacVidCards eBay Store. Every Mac with an NVIDIA GPU blew away the Mac Pro with AMD GPU. That's because the ray-traced 3D render option requires CUDA support. Our 6-core Mac Pro with Quadro 4000 was at least 10 times faster than the same Mac Pro with the Radeon HD 5870. I say "at least" because the times in the graph are an optimistic guesstimate. We stopped the render after 5 hours and added AE's estimated remaining time. The actual render time is likely much longer since the last few frames add 'killers' like motion blur and depth of field. The CPU was loafing along while the NVIDIA CUDA "aware" GPU was doing all the heavy lifting. This is due to the fact that the ray-traced 3D animation was made of solids with no external media or textures. Conversely, the CPU of the Mac Pro with the AMD GPU was running at full tilt (1200%) while the RadeonHD 5870 was "taking a coffee break" -- since it does not have CUDA support (proprietary to NVIDIA). Adobe does, however, "toss a bone" to AMD by using OpenCL acceleration instead of CUDA in Photoshop CS6. Premiere Pro CS6 lets you choose either CUDA or OpenCL. One pro user reported that choosing OpenCL in Premiere Pro provides double the performance boost of CUDA. On July 13th we added results for the GeForce GTX 580 and 570. These GPUs are not officially supported by Apple but certainly impressed us with the speed at which they rendered the ray-traced 3D animation (13 and 16 minutes respectively). NOTE: We had to "cheat" a little to get the 2012 MacBook Pros to support ray-traced 3D rendering since their GeForce GT 650M is not on the official list -- yet. We had to go into the After Effects package contents folder and use the "sudo nano" Terminal command to add the GeForce GT 650M to the raytracer_supported_cards file that contains a list of CUDA compatible GPUs. There are plenty of After Effects CS6 projects don't benefit from GPU acceleration. We use a sample project created by Total Training for benchmarking various Macs and PCs. It is one of our real world ways of maxing out the CPU and memory. We enable Multiprocessing in the Performance preference panel and specify 1.5G of RAM per background spawned sub-process. In the graph below, we collected test results for a variety of Macs (plus one killer Windows PC). Time is in seconds. LOWEST number equals fastest. The more cores you have, the faster your CPU intensive After Effects CS6 project will render -- especially if you optimize the multiprocessing settings in Preferences. However, the Mac Pro with 8-cores is not twice as fast as the MacBook Pro or iMac with 4-cores. Nor is the 12-core Mac Pro three times faster. The more memory, the better. Compare to speed of the 2012 MacBook Air to the 2011 MacBook Air. Though both are dual core with core clock speed 11% apart, the 2012 MBA rendered the test project 40% faster. It's because the 2012 MBA had 8GB of RAM versus the 2011 MBA's 4GB of RAM.